Management Technologies is pleased to offer individuals and organizations a variety of products to help prepare for the AACE Earned Value Professional (EVP) exam. The Earned Value Professional (EVP) certification has been recognized by both companies and government agencies as an indicator of one's thorough knowledge of EVM, EIA 748, and related project management topics. This certification is administered by AACE using a five hour exam. The exam includes a memo writing assignment where the candidate is given a scenario and instructions. The response is written using a text editor. Some EVPs have said this is most difficult certification exam they have taken from either AACE or PMI. According to AACE the overall pass rate varies around 54%. Our EVPrep(tm) materials include our EVPrep Boot Camp streaming video series and our EVPrep Study Guide. We also conduct EVPrep webinars and EVPrep two-day workshops for organizations. Organizations can request a quote for an on-site two day workshop, a webinar, or group purchase of the EVPrep Video Boot Camp or EVP Study Guide. The EVPrep Video Boot Camp contains ten videos of about an hour or so each. It’s content is identical with our on-line interactive webinar and corporate on-site programs. It includes the four EVP trial exams with a discussion about each question and its answers. After completing the last video customers can download the EVPrep Study Guide for free. A completion certificate can be printed to claim fourteen guaranteed PMI PDUs. It's on-line 24/7/365. No need to schedule to attend a webinar. The best part is the low price. With each evolution of our EVPrep workshop we have been able to reduce the price. Our public sessions were $795 and you had to travel to the venue, our webinars were $495 but might be at3 AM for you, and now the same content is available on YOUR schedule for $295! In a survey of our customers the Study Guide has been shown to statistically improve the outcome of the Exam above the AACE published average pass rate. 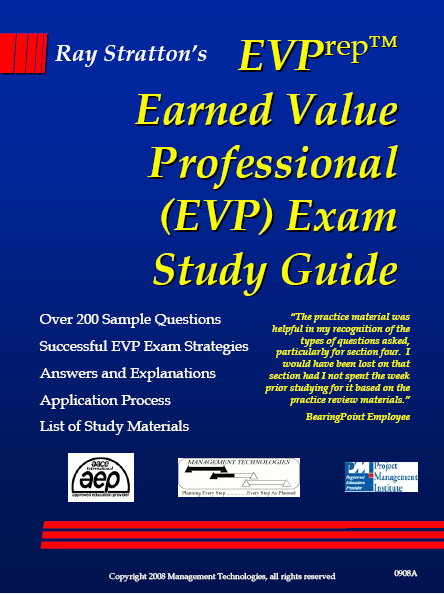 "Ray Stratton's EVPrep™ Earned Value Professional (EVP) Exam Study Guide." Each section contains exam-like questions, answer sheets, and the correct answers with explanations. Try some questions from the book and then check your answers. Read the book review in PM World Today February 2009 issue. Ray: Meant to reach out to you after I passed the EVP exam. Although, as I look at the certificate, it is dated March 2017, so it has been a while. Your online boot camp along with the test prep question booklet were extremely helpful. Especially your 5 paragraph memo strategy from the boot camp. A new BearingPoint EVP said, "The practice material was helpful in my recognition of the types of questions asked, particularly for section four. I would have been lost on that section had I not spent the week prior studying for it based on the practice review materials." "I bought your EVP study guide the day before my exam because I wasn't confident the AACEI EVP study guide was good enough. I used their study guide for 3 months but it only cover (sic) half of what I encountered on the exam and the other half was aided by your study guide." Victor T.
You will spend between $500 and $625 to register for the Exam. Spend $65 more and increase your chance of passing. "I feel your study guide had helped me complete the best possible preparation for the exam. I feel it was an invaluable reference for my studies." The Study Guide is only available from Management Technologies. It is available as a spiral bound book or as PDF files. Here's some information to help you decide which style is right for you. One PDF file containing all four parts. Each part has Questions, and Answers and Explanations. You can not print this file. The Introduction will tell you how to download free answer sheets that may be printed or you can note your answers on plain paper. Shipping via USPS Priority Mail (US Customers, $6.45 for one book, delivery in about 3 working days, or International Priority Mail ($30 USD) for one book, delivery in about 10-15 working days). US overnight and International 3-5 day shipping is available during checkout. Rates for more than one book are computed during checkout. No shipping cost, instant delivery via a file download to your computer. Requires a browser and pdf reader. Sales Tax for California Customers, 7.50% ($4.88), All others no sales tax. No sales tax. EVP is a registered mark of the Association for the Advancement of Cost Engineering, International.